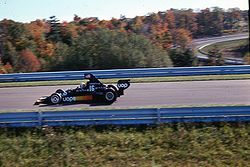 The 1975 United States Grand Prix was a Formula One motor race held on October 5, 1975, at the Watkins Glen Grand Prix Race Course in Watkins Glen, New York. It was race 14 of 14 in both the 1975 World Championship of Drivers and the 1975 International Cup for Formula One Manufacturers. It was the 25th United States Grand Prix since the first American Grand Prize was held in 1908 and the 18th since the first United States Grand Prix at Riverside in 1958. Niki Lauda won the race for Ferrari. The race was won by the new world champion, Austrian driver Niki Lauda driving a Ferrari 312T. 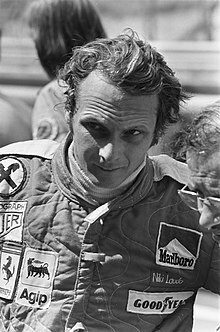 Lauda took his fifth win for the season by a four-second margin over outgoing world champion, Brazilian Emerson Fittipaldi in a McLaren M23. Fittipaldi's West German team mate Jochen Mass finished third. The second place allowed Fittipaldi to confirm runner's up position in the points race after a half-season long battle with Argentine Brabham driver Carlos Reutemann, although Fittipaldi's McLaren team would fall one point short of overhauling Brabham in the Constructors battle to be second behind Ferrari. Ferrari had already taken eight poles, five wins, the Drivers' Championship and the Constructors' Championship in 1975, but had never won the United States Grand Prix. Nor had any driver ever won the American race in the year he claimed the title. New world champion Niki Lauda took pole position and won the race to interrupt both of these streaks. There was controversy before practice began. The Canadian Grand Prix had been cancelled and the organizers had arrived in the paddock with a writ to freeze the prize money over legal wrangles. There were also disputes with the Grand Prix Drivers' Association over transfer fees and wages. The track had been modified for this race by the addition of the "Scheckter chicane" at the bottom of the hill entering the esses. After François Cevert's fatal crash there two years earlier, the corner was deemed to be too fast. Named for the Tyrrell driver who suggested it, the chicane was expected to add nearly five seconds to the lap times. Mark Donohue had been fatally injured in practice for the Austrian Grand Prix, and John Watson had replaced Donohue on the Penske team. Penske fielded the brand new PC3 for Watson, Although bearing the Penske name The Englishman used the car in practice, but due to a technical failure was forced to switch to the old PC1, which was in the paddock as a demonstrator, for the race. Lauda was quickest from the start, as the drivers got accustomed to the new layout. Vittorio Brambilla briefly registered in with quickest time on Friday, just one hundredth of a second better than Lauda. Lauda's engine developed a vibration, but the Austrian used the spare car to beat the March's time by almost a second. On Saturday, it was Emerson Fittipaldi who briefly held the pole at 1:42.360, but Lauda answered his challenge as well, ending the discussion at 1:42.003. Carlos Reutemann, Jean-Pierre Jarier, Mario Andretti and Brambilla took the rest of the top six positions on the grid. On race days, Watson's Penske suffered electrical problems in the morning warmup. As he was being towed in, the crew retrieved the display car from the First National Citibank podium in the paddock and prepared it to enter the race. Lella Lombardi's Williams suffered an electrical failure, and her teammate Jacques Laffite was unable to race after mistaking visor cleaning fluid for his eyedrops. Lombardi tried to use Laffite's car, but she didn't fit. Tom Pryce in a Shadow DN5 during the race. Lauda led the field away from the grid and through the new chicane for the first time, followed by Fittipaldi, Jarier, Brambilla, Reutemann and Andretti. Carlos Pace and Patrick Depailler collided on lap 2, both retiring from the race as a result. The gap between Lauda's Ferrari and Fittipaldi's McLaren settled at about one second. Mass, who had moved up to sixth, suddenly lost three places to Andretti, James Hunt, and Ronnie Peterson when he accidentally switched off his engine. On the next lap, with Mass now immediately in front of him, Clay Regazzoni smashed his nose against the rear wheel of the McLaren and lost more than a lap as he pitted for a new one. On lap 10, Reutemann's engine expired and Andretti's front suspension collapsed. This left Lauda and Fittipaldi twelve seconds ahead of Jarier, who was five seconds clear of a group containing Hunt, Brambilla, Mass, Peterson and Scheckter. Lauda's teammate Regazzoni was caught by the leaders on lap 18, after his lengthy pit stop. He let Lauda by, but held up Fittipaldi for six laps, despite blue flags being waved to indicate that he should be let through. Eventually Regazzoni was black flagged and brought in for a warning on lap 24; Ferrari manager Luca di Montezemolo instructed Regazzoni to continue the race, but withdrew him from the race in protest just after four laps. Back on the track, Fittipaldi was now 15 seconds behind Lauda, Jarier had retired with a seized rear wheel bearing, Brambilla dropped back to seventh suffering from loose seat supports, and Hunt, Mass, Peterson and Scheckter were battling for third. Mass overtook Hunt on lap 33. With nine laps to go, Peterson also passed Hunt, who was struggling with his gear selection and brake balance. Three laps from the finish, Mass's brakes began to fade, and Peterson closed, but locked up his left front tire under braking. The resulting flat spot slowed him enough for Hunt to retake fourth on the last lap. Lauda took the win by just under five seconds. This was the final race for Tony Brise and Embassy Racing with Graham Hill. On the evening of 29 November 1975, double-world champion Graham Hill was piloting a Piper Aztec light aircraft from France to London. His passengers were team manager Ray Brimble, driver Tony Brise, designer Andy Smallman and mechanics Terry Richards and Tony Alcock. They were returning from Circuit Paul Ricard where they had been testing the GH2 car being prepared for 1976. They were due to land at Elstree airfield before onward travel to London to attend a party. Shortly before 10pm, the plane hit trees beside a golf course at Arkley in thick fog. In the ensuing crash and explosion, everyone on board was killed. As the team now only consisted of the deputy team manager and two mechanics, it was impossible to continue, and so the team was closed down. ^ "Weather information for the "1975 United States Grand Prix"". The Old Farmers' Almanac. Retrieved 2013-11-11. ^ "1975 United States Grand Prix Entry list". ^ "10 Of The Strangest Reasons Why Drivers Have Retired From F1 Races". Retrieved 7 July 2017. ^ "Lauda wins as Regazzoni is criticised". 5 October 1975. Retrieved 7 July 2017. ^ "This day in history-- 1975: Graham Hill killed in air crash". BBC. Retrieved 9 January 2016. ^ "Graham Hill, 46, Retired Racer, In Fatal Crash Piloting His Plane". New York Times archive. UPI News Service. 1 December 1975. Retrieved 9 January 2016. ^ "Motor racing legend Graham Hill killed in a plane crash". The Guardian. London: Guardian Newspapers. 2 December 2008. Retrieved 24 October 2011. ^ Bardon, P. "Report on the accident at Arkley Golf Course". AAIB Formal Reports. Air Accidents Investigations Branch. Retrieved 24 October 2011. ^ "1975 United States Grand Prix". formula1.com. Archived from the original on 11 June 2014. Retrieved 22 December 2015. ^ "US Grand Prix 1975". motorsport-stats.com. Archived from the original on 2007-01-12. Retrieved 2017-08-11. ^ a b "United States 1975 - Championship • STATS F1". www.statsf1.com. Retrieved 21 March 2019. Rob Walker (January, 1976). "17th United States Grand Prix: Ferrari's First World Championship Formula 1 Win In America". Road & Track, 70–73.